Struggling readers are not always easy to spot. With some kids it's immediately obvious that they're struggling. They know it and you can see it. But very often, a struggling reader will say things like 'I don't like reading' and 'reading's boring' to hide the fact that he's struggling. If your child says he doesn't like reading - or if he resists anything involving reading - you need to find out what's going on. The bottom line is that reading is a crucial skill for success at school. Kids need to be confident and competent readers if they're going to read and understand all the stuff they need to read throughout primary school and high school. 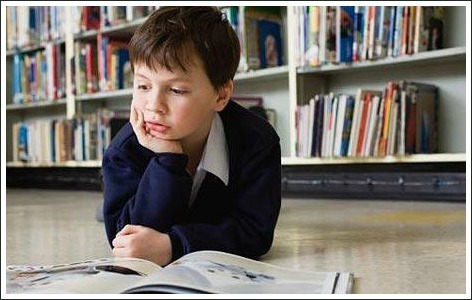 So how do find out why your child is struggling to learn to read or why he dislikes reading? It's important to work out which one is the problem for your child but how do you do this? I've found that the best strategy for talking to a child about this is to have a general, no-pressure chat, perhaps while you're doing something else. Your child might be quite willing to talk, which is great. Try not to get discouraged if you come up against this sort of resistance but do gently persist. Kids - like all of us - shy away from talking about things that make them feel uncomfortable and it may take a bit of reading between-the-lines to understand what's going on. If the problem seems to be that your child has trouble finding books that appeal to him - or he finds the books he's been given to read at school boring - spend a bit of time looking for the right book. If your child is finding reading difficult, don't despair. There are definitely things you can do to help. The first step is to try and work out the exact nature of the difficulty your child is having. Sometimes there can be a hearing or vision problem or a reading disability or learning disorder which needs a diagnosis and specific treatment. It's important to rule this out first, before looking at other strategies to help your child improve their reading skills. Or it may just be that your child needs to read more so that he becomes a better reader, starts to find it easier and gains confidence. If his is the case, a few well-chosen books, some encouragement and a bit of guidance from Mum or Dad can work wonders!